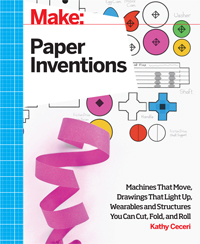 Maker Faires are springing up all over, in a city or a Barnes & Noble near you, and we asked Kathy Ceceri, author of Making Simple Robots and the upcoming Paper Inventions, about what these events are all about and how you can bring some cool DIY tech into your child's life. It's okay -- you don't have to have a 3D printer in your garage or understand complicated computer functions. Kathy talks about how English majors, artists, and crafters can participate in and benefit from Maker Faire. To see some of the projects from Kathy's book when it comes out, go to the Make: site.